MAY WE "SHARE" MANY TRIPS TOGETHER! Southwest Airlines Co. (Southwest) is a passenger airline that provides scheduled air transportation in the United States. Southwest Airlines Co. was founded in 1967 and is headquartered in Dallas, Texas. 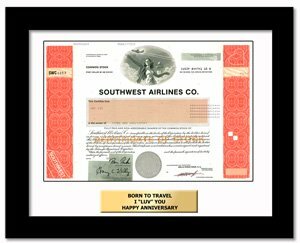 Southwest's stock ticker symbol is LUV making it a favorite for those lovey-dovey occasions like anniversaries.